This article is about the sports term. For survey roads, see concession road. For other uses, see Sideline. The "sidelines" are the white or colored lines which mark the outer boundaries of a sports field, running parallel to each other and perpendicular to the goal lines. The sidelines are also where the coaching staff and players out of play operate during a game. The area outside the sidelines is said to be out of bounds. The term is predominantly in use in American football, Canadian football, field lacrosse and basketball. In rugby union, rugby league and association football, they are known as touch-lines. The foul line is a similar concept in baseball. Sports in which the playing surface is bounded by walls, such as ice hockey, box lacrosse, and indoor football, do not use sidelines; in these sports, coaches and reserve players are positioned in recessed benches behind the walls. 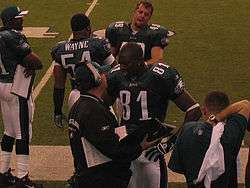 The sideline can be used metaphorically to refer to players who have been "benched," meaning that they have been taken out of the game purposefully by the coaching staff due to poor performance in the game or previous play. Establishing shots of these players may be used by televised sports programs to indicate potential roster switches, or to build a narrative of the failure or success of the coaching staff's decision. Likewise, images of the sideline may suggest that the highlighted player had done something of interest outside of the confines of play. For example, in American football, dousing the head coach with water or sports drink is a popular way of celebrating crucial victories, established as a tradition by the New York Giants of the National Football League in the mid-1980s. The term "to be sidelined" refers to a player in a sports event who is unable to play (e.g. confined to the sideline) for injury, suspension, or other similar reasons. This term has spread into a business context; a project that has been "sidelined" is no longer a major concern or objective of the proponent company.